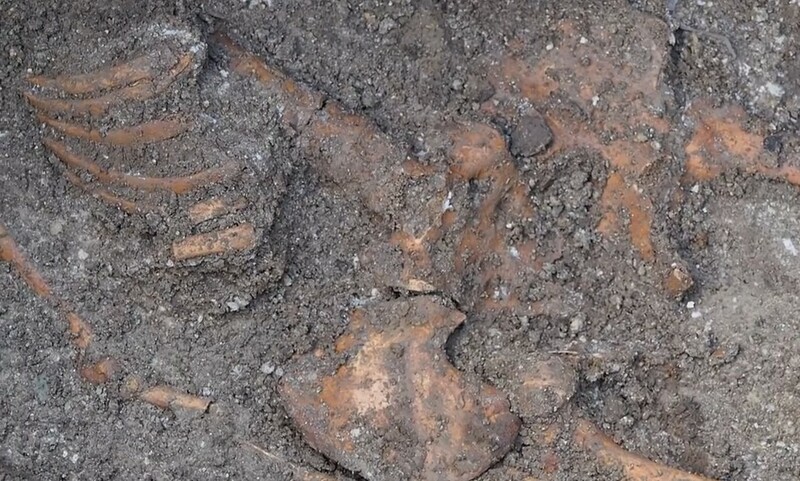 Bulgarian archaeologists carrying out rescue excavations in the Ancient Thracian, Greek, and Roman city of Odessos, today’s Black Sea city of Varna, have discovered three more skeletons in what essentially appears to be an ancient necropolis, lead archaeologist Prof. Dr. Valeri Yotov has announced. On March 17, 2015, during excavations of the so called Varna Largo near the St. Nikolay Church, the Bulgarian archaeologists stumbled upon a man’s skeleton described by some researchers, passers-by, and the local media as “tall" or even “giant". Three more skeletons have been found in the last couple of days during the continuing excavations of the Late Antiquity fortress of ancient Odessos (known in Roman times as Odessus), Yotov is cited as telling local news site Varna Utre on Saturday, March 28, 2015. The discoveries of more skeletons have changed radically the working hypothesis of the archaeologists from the Varna Museum of Archaeology, who previously believed that the man in question, whose skeleton is dated back to the late 4th century or early 5th century, was probably a construction worker who died during the construction of the Odessos (Odessus) fortress wall, possibly from a work-related incident, and was buried right on the spot, in a deeper pit dug up for construction purposes. Now, Yotov says that he and his colleagues might have discovered an ancient necropolis which, according to initial estimates, is older than the Late Antiquity fortress wall of Odessos / Odessus under which it has been found. However, the Director of the Varna Museum of Archaeology, Prof. Dr. Valentin Pletnyov, has urged caution regarding the necropolis hypothesis. Speaking in a media interview later on Saturday, he has pointed out that the discovery of the human skeletons does not mean yet that they were buried in a necropolis. He has pointed to the fact that no additional artifacts have been found in the graves yet, Top Novini Varna reports. As the excavations continue, the archaeologists from the Varna Museum are yet to study the newly found ancient necropolis in depth, and to try to figure out why the Late Antiquity fortress wall, which is just one of Odessos’s several fortress walls dating from different time periods, was constructed on top of a cemetery. Yotov has been trying to convince the media and the passers-by in downtown Varna that the seemingly tall man’s skeleton was really not such an important discovery compared with the Late Antiquity fortress wall under which he was lying, and that the ancient man was certainly not a “vampire" or an “Atlantis giant". As the Varna archaeologists have excavated the skeleton in full only now, more than 10 days after its initial discovery, and have just measured it, Yotov has announced that the actual size of the ancient man turns turns out to be “modest” – “only" 165 cm, or about 5 feet 4 inches. Even keeping in mind the fact that people were relatively shorter in ancient times, and that the Varna man was probably about average in size, the announcement is expected to debunk the media reports about the “giant" found in Varna. Meanwhile, early in the morning on Saturday, March 28, 2015, the site of the ongoing excavations in downtown Varna was flooded as a result of a water supply failure, Varna Utre reports, with the water covering almost completely the ancient second earthen jar discovered during the recent excavations which, not unlike the “tall man’s skeleton”, has not been fully excavated and has been left in situ. What is more, the 1500-year-old earthen jar has been hit by an earth mover driven by workers from the Varna water utility and cracked. Commenting on the “flood",he has explained that the earthen jar was kept in situ (and still filled with soil) precisely in order to preserve it better. The newly found skeletons from the necropolis under Odessos’s Late Antiquity wall have been covered with nylon and soil on top of it in order to protect them from the weather and flooding from water supply pipes. Thus, Yotov has assuaged fears that the frequent flooding caused by the problems in the water supply and sewerage system in downtown Varna (whose rehabilitation was how the latest archaeological discoveries were made in the first place), or the weather might do some damage to the uncovered finds. Yet, he has also sought to assured that the ancient pithos will be dug up and restored by the museum experts. Pletnyov has made it clear that in the fall the local archaeologists plan to remove a fountain with dolphin statues near the St. Nikolay Church in order to excavate the ruins of the fortress tower of the Late Antiquity wall of Odessos whose location is known to them. 2019 archaeologyinbulgaria.com. All rights reserved.